When they are rolling through the streets in strollers, toddlers are usually the ones throwing temper tantrums. Now it's their parents who are having the biggest fits. On Monday the U.S. Consumer Product Safety Commission (CPSC) announced a stunning recall of some 1 million Maclaren strollers that were released nationwide from 1999 through November of this year. Maclaren, the 42-year-old British brand, is wildly popular among the young-urban-professional set. The strollers are light, compatible and upscale but not terribly expensive (the recalled models cost from $100 to $360). This recall doesn't just involve one specific model. 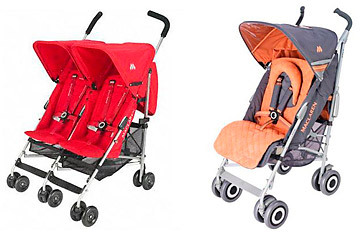 Stop using any single- or double-umbrella stroller with Maclaren written on it, says the CPSC. The problem: Maclaren received reports that 12 children had their fingertips amputated after they placed their fingers in the hinge where the stroller folds. "This is a very serious hazard," says Scott Wilson, spokesman for the CPSC. "We know child behavior, we know kids like to explore and sometimes put their fingers in places where they shouldn't be. But finger amputations that result from using a product that parents expect to be safe is unacceptable." The recall is a nightmare for Maclaren. Prior to Monday, its strollers had a reputation for dependability. Now they're the ones that could cut kids' fingers off. The search terms "Maclaren fingertip amputation" pulled up more than 5,000 results on Google. The parent blogs are buzzing. One, Daddy Types, has dubbed the affair Macopalypse 2009. Another, called Mother Load, wrote the post "MacLaren recall: is there nothing safe?" The author wrote, "Fingertip amputation? And they had to get to TWELVE cases before they issued a recall?" The nature of the product will make Maclaren's task even harder. "Anything relative to child safety tends to be off-the-charts viral," says Pete Blackshaw, a brand consultant for Nielsen Online. According to Blackshaw's data, new mothers are three times more likely than others to use social media and start blogs. "Given the higher order of sensitivity, parents are much more diligent," says Blackshaw. "They want to talk to friends, family and even strangers about their decisions. They'll go the extra distance." Maclaren has posted two safety videos on YouTube, one of which demonstrates how to use the new hinge covers. Blackshaw recommends that Maclaren dedicate a Twitter account to dispensing mea culpas, information about how to order the repair kit and explicit instructions on how to use the strollers safely. As of Monday afternoon, a Twitter account called @MacLarenStrolle was linking to Web pages that don't exist. Another, @maclarenbabyUK, posts links to new Maclaren products, but there were no posts addressing the recall. Maclaren's response hasn't been sterling. Yet over the long term, the company could recover. "I don't feel threatened by the stroller," says Greg Allen, a father of two who writes Daddy Types and who plans to keep using his Maclaren. And before saying how "really pissed off" she was about the recall, the author of Mother Load wrote, "I'm not ready to break up with you, Maclaren." The question is how many Maclaren parents will forgive and forget.